I’m having a love affair. And what is the object of my affection? It’s cherry blossoms! I must admit, I feel like I’m cheating on my beloved peonies. But they won’t be in town until May, so I feel free to indulge. And what better place to explore my passion than draped over the kitchen table? 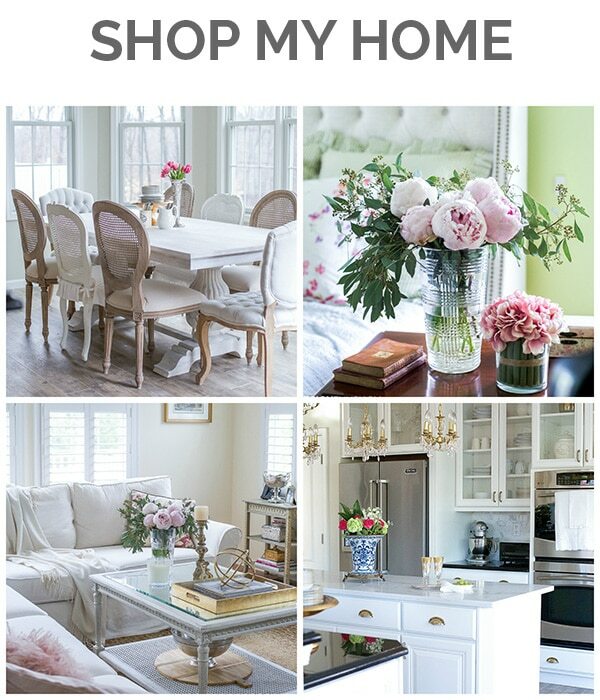 Today I’m joining with a group of friends to bring you the Styled & Set spring blog hop. 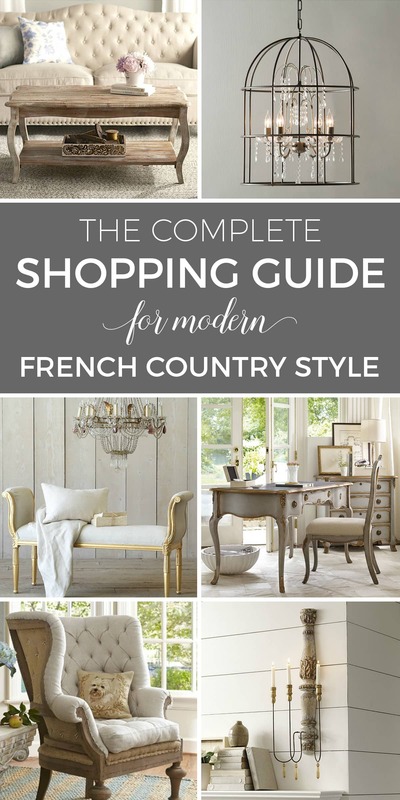 This year we’ve changed things up a bit to include seasonal decor, as well as tablescapes. It’s a tighter group of bloggers and we’re doing only 2 days, so be sure to visit all of the posts linked at the bottom. (Tomorrow I will share the second group.) If you’re coming over from Zevy Joy, I’d like to extend a special welcome! 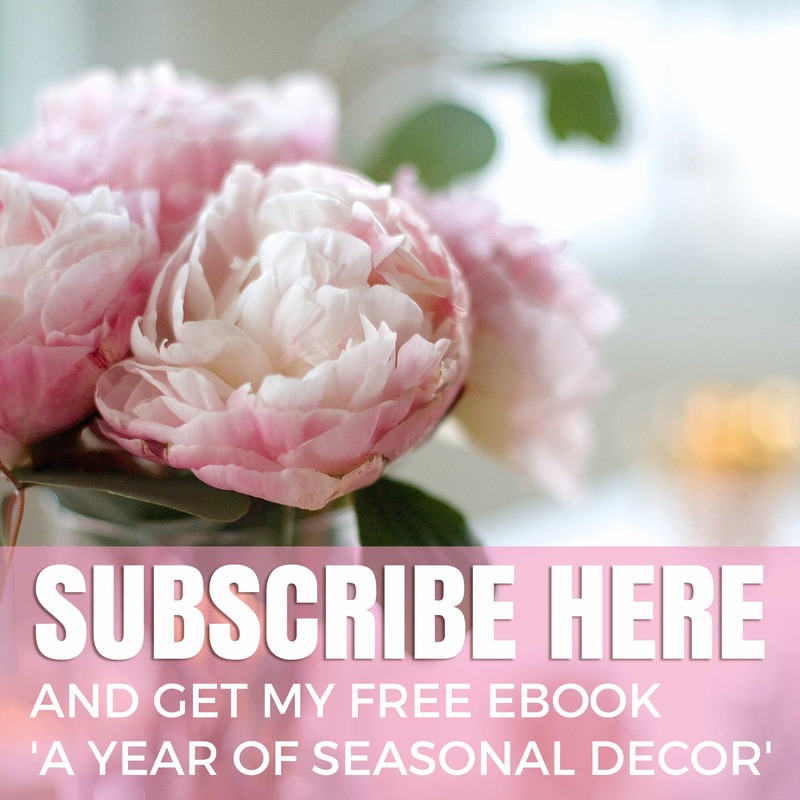 I had planned to write a post about the various different ways to use cherry blossoms to decorate your home… and I likely still will. But the little pink beauties made such a statement on my table that I decided it merited its own post. 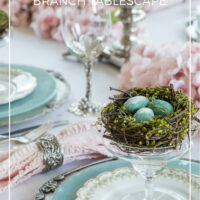 So today I’m sharing my cherry blossom branch tablescape and welcoming spring in the process. 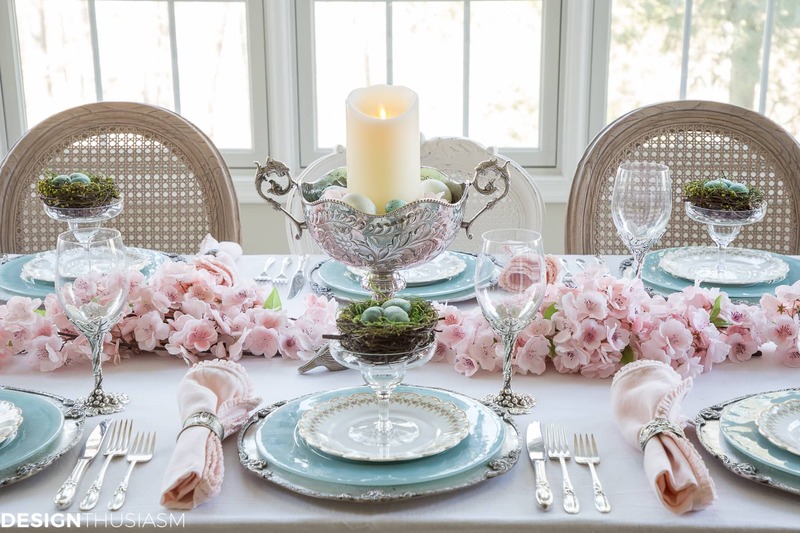 There are 3 key concepts that came together to deliver this table setting. This is actually where my table started. A key motif signaling the rebirth that spring represents, these wonderful birds’ nests have three velvet eggs in each and can be found HERE, from my sponsor, Plush Pumpkin. 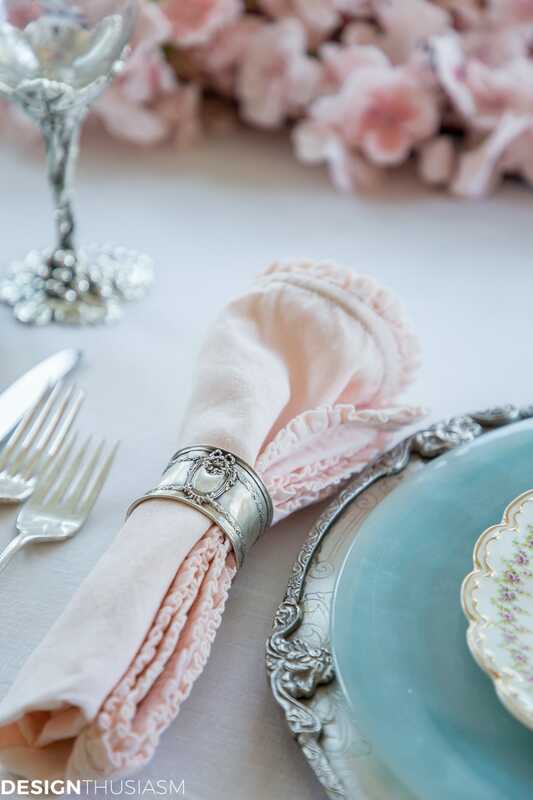 I knew they would look charming on my table and I opted to place one at each place setting. They fit perfectly in the shapely glasses that I found in a dusty box at my parents’ house. Which brings me to the second key aspect of this table setting. 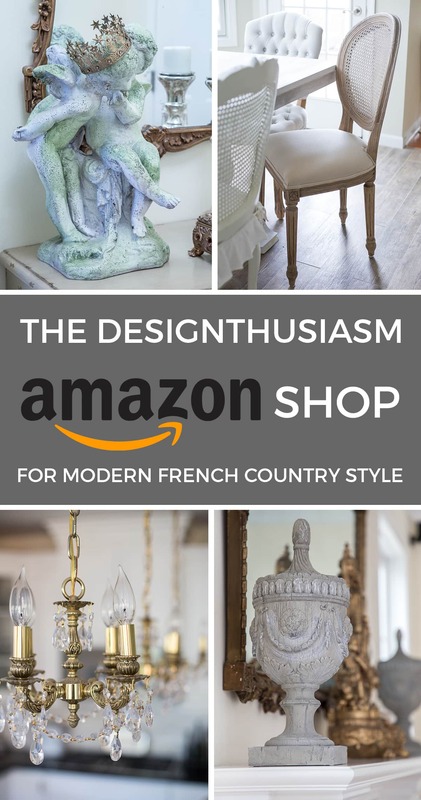 My tables tend to have a distinct character which is generally defined by a mix of casual with formal, utilizing a healthy dose of antiques. When those pieces have been passed down in my own family, they take on an even greater meaning. I found many lovely surprises while cleaning out my parents’ home and some of the nicer pieces I’d never seen before. How sad that they were packed away for a special occasion, but at least I rescued them now. But the aforementioned glasses I remember my mom serving fruit cocktail in at many a family dinner. I almost didn’t keep them because their odd shape made them difficult to store and they were truly extraordinarily dusty. Yet something told me to hold onto them and once they were cleaned up, their beauty glistened through. 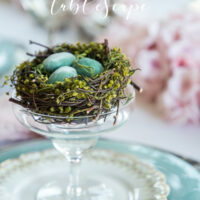 The perfect perch for a birds’ nest! On this table I also used my mom’s silver and my mother-in-law’s Limoges salad plates. The vintage silver napkin rings I’ve been collecting over time and they comprise a mix of different patterns. 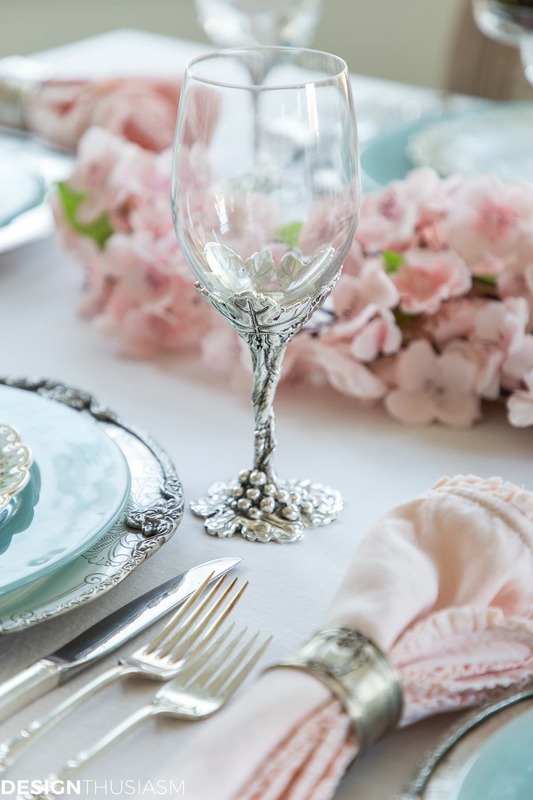 The newer pieces include grape leaf wine goblets, ruffled linen napkins and aqua alabaster dinner plates. 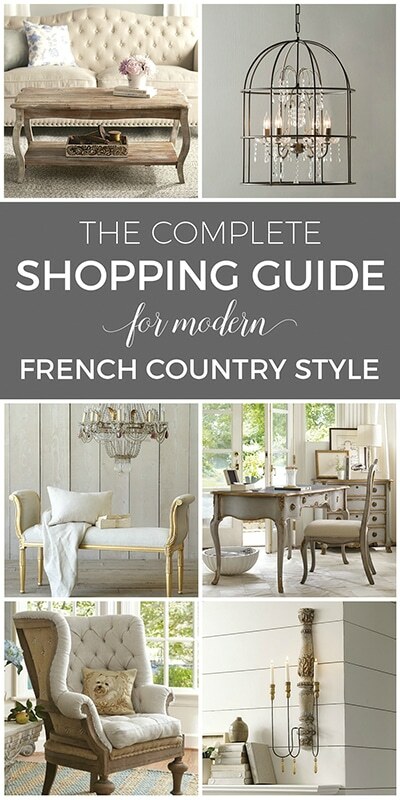 They keep things from getting too serious by lending a more casual tone and yet they are equally artful in design. 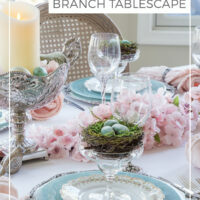 The third key element is the use of cherry blossom branches as a runner down the center of the table. The soft pink cherry blossoms are utterly delightful in their seasonal splendor and they leave no doubt what season we are celebrating. 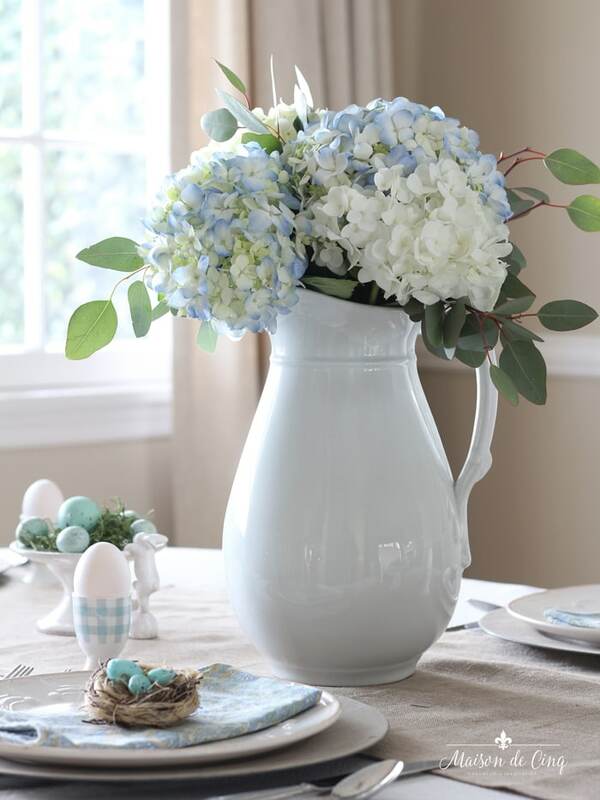 For my centerpiece I wanted something that would add height without competing with the lovely blossoms. 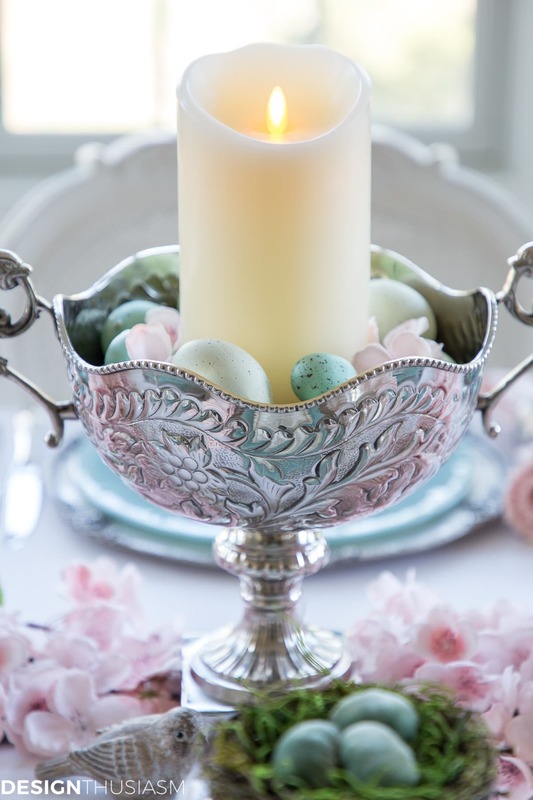 I chose a pillar candle encircled with pastel eggs and scattered a few loose blossoms into the mix. 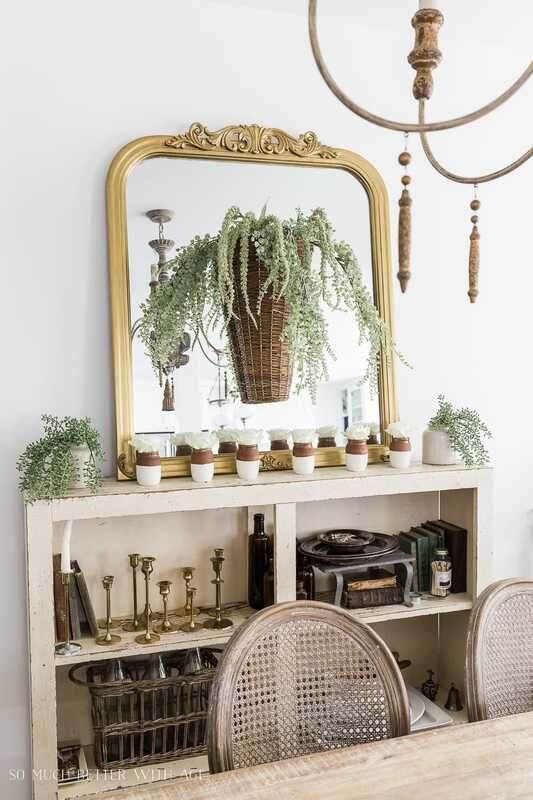 The final result is a table that mixes old and new, casual with elegant and gentle and rugged together. 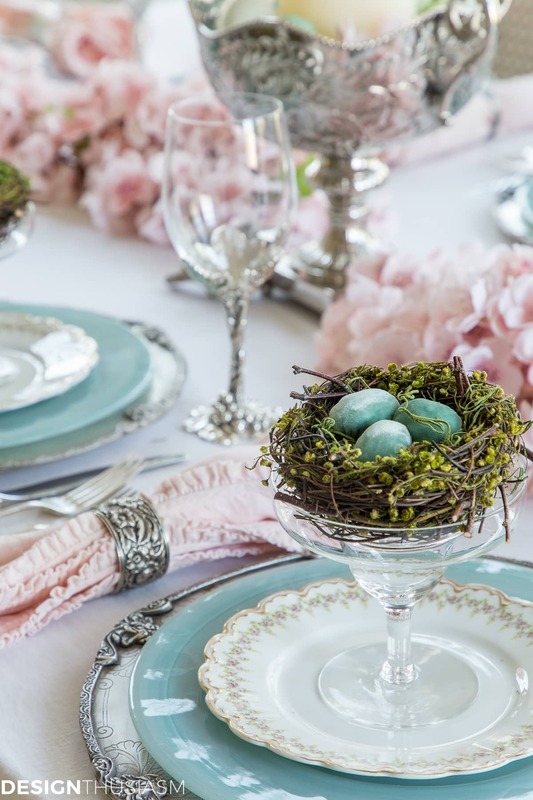 The heirlooms add gravitas, while the birds’ nests add whimsy and the blanket of blossoms bridges the two. A love affair to remember, indeed! Up next on the tour is Lucy from Craftberry Bush. Her styling is always so gorgeous and I know you’ll be inspired! 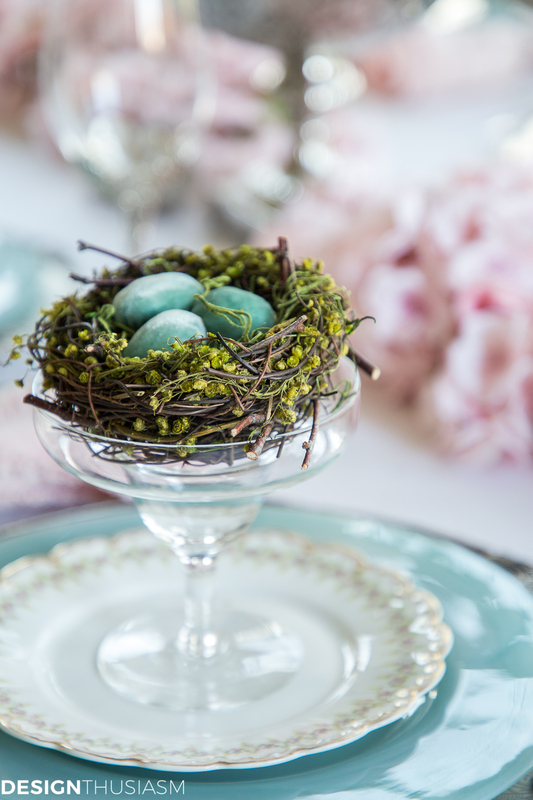 We must have been on the same wave length – I used a very similar little birds’ nest with blue eggs in my tablescape! 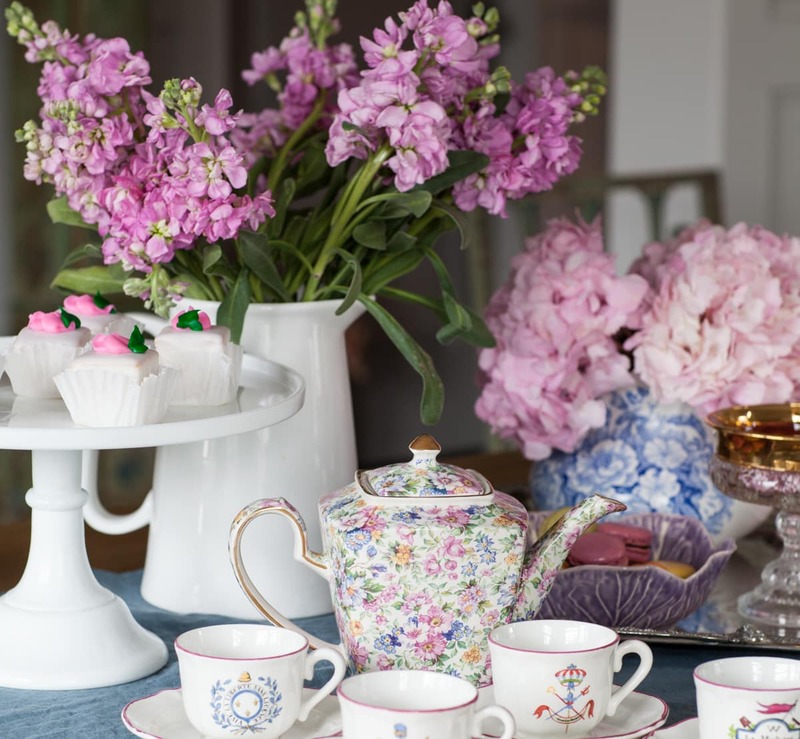 Love all your antique pieces added in, and the mix of blue with the soft pink cherry blossoms is so pretty. Elegant, as always! And thanks so much for having me Lory! 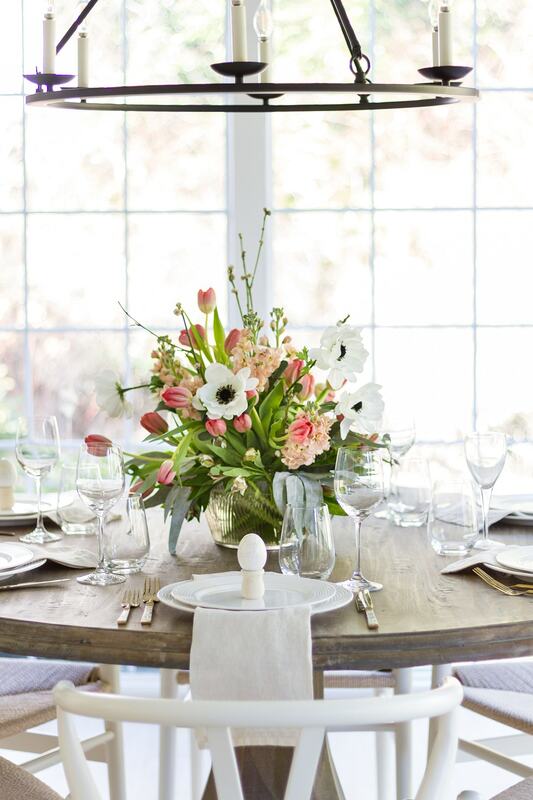 Lory, your table settings are always stunning! 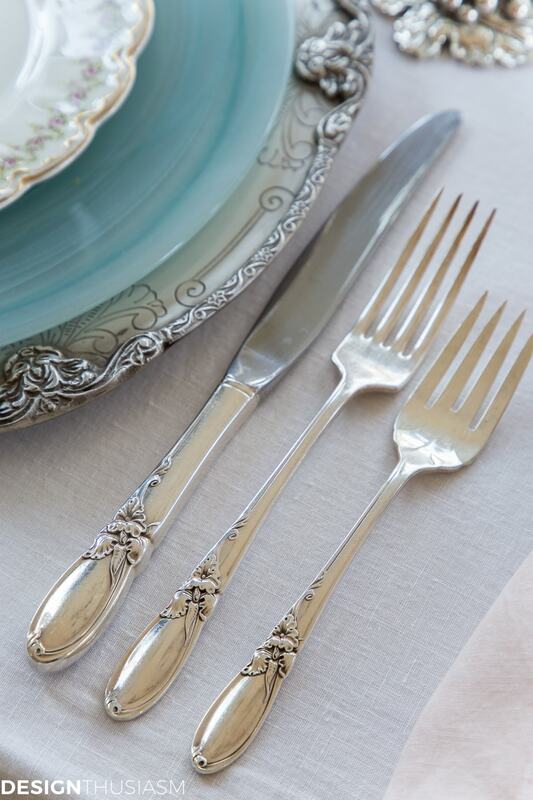 I love the grape leaf goblets and the beautiful silverware. 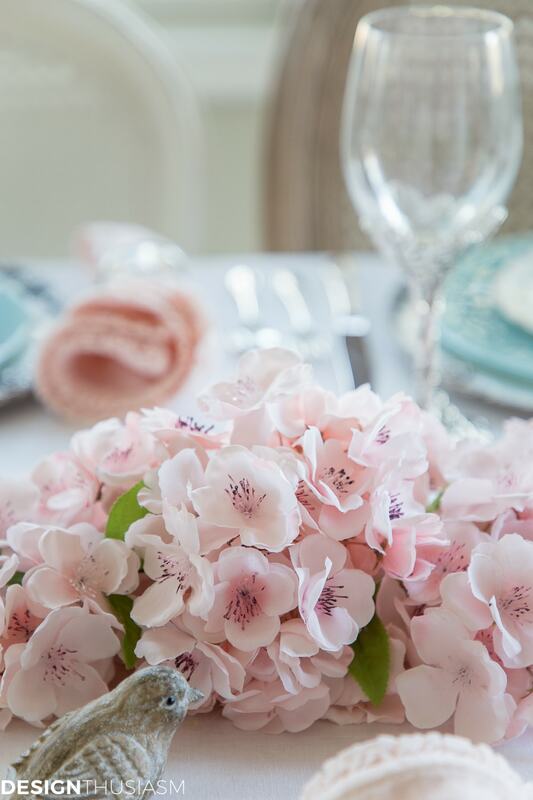 Then you’ve got the pretty napkins and gorgeous cherry blossoms to top it all off. Perfection, my friend! Lory, this is so elegant! I love the cherry blossom runner and the beautiful silver from your mother. It’s so nice you’re able to bring it out of storage and get some use out of it. So beautiful! 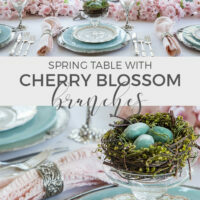 Love the faux cherry blossoms Lory and it’s making me want to head out to the craft store! Just perfect! Lory thank you for including me in Styled+ Set! 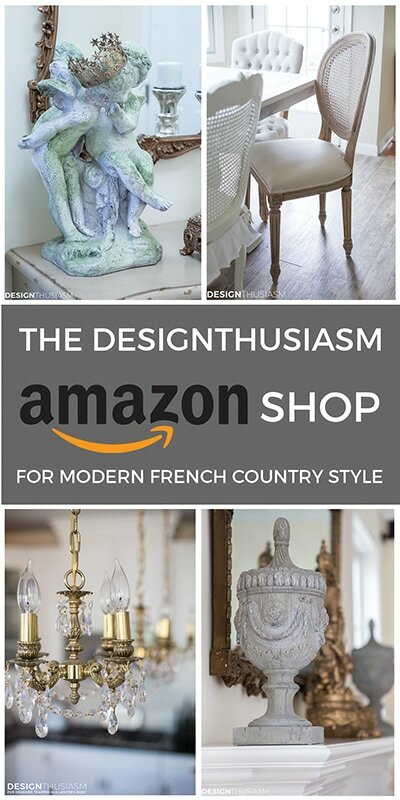 Your table is sublime! Breathtaking! Beautiful! 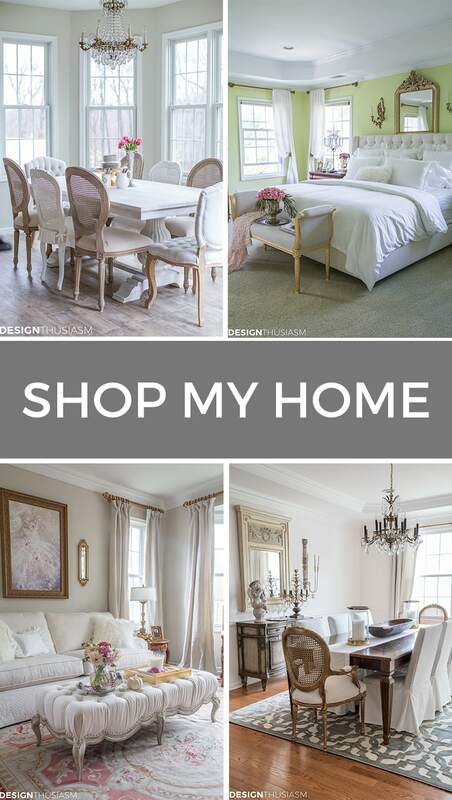 What a beautiful mix of touching heirlooms with such sweet memories curated newer pieces (love those wine goblets) and of course the cherry blossoms. No worries about cheating on the Peonies. By the time they come around the cherry blossoms will be but a beautiful memory! 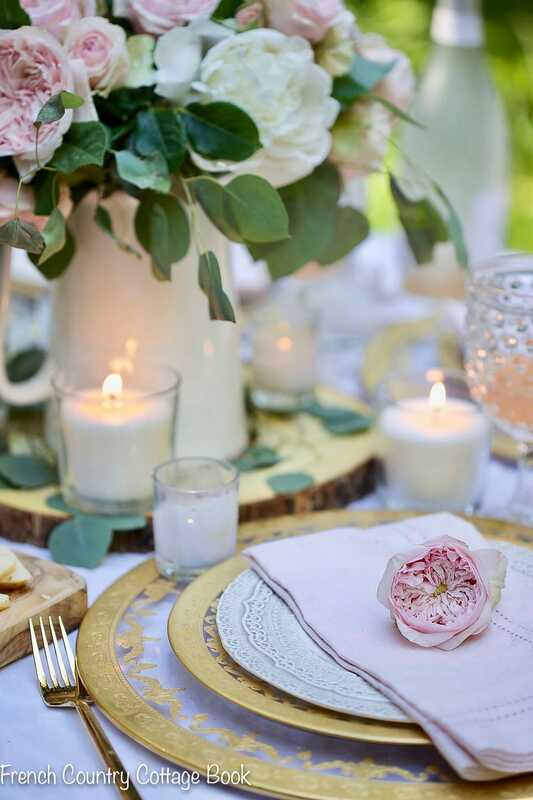 Lory, I love this tablescape! How many branches of cherry blossoms did you use to make your table runner? I would love to use this for an upcoming supper club here. Lory I just love your tables! 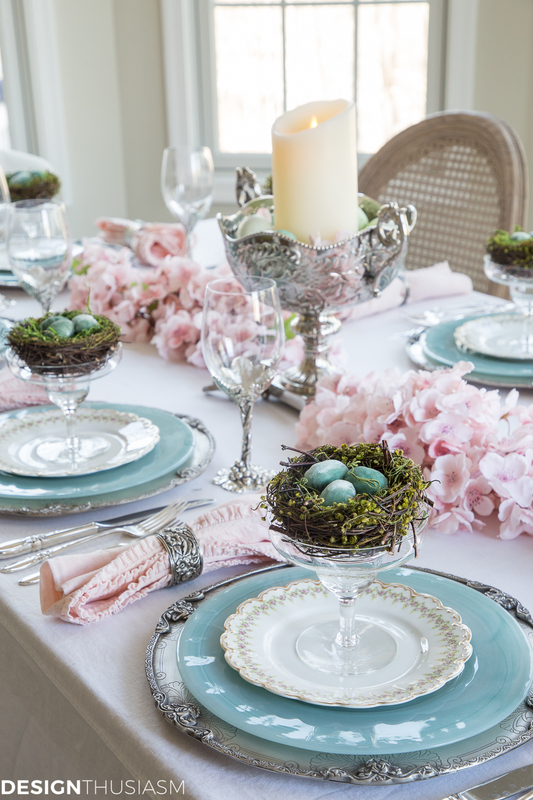 The cherry blossoms and the bird nests are such a beautiful touch! 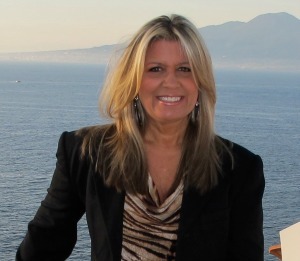 Your tours are always a treat, xo! Wow! Those cherry blossoms are stunning! 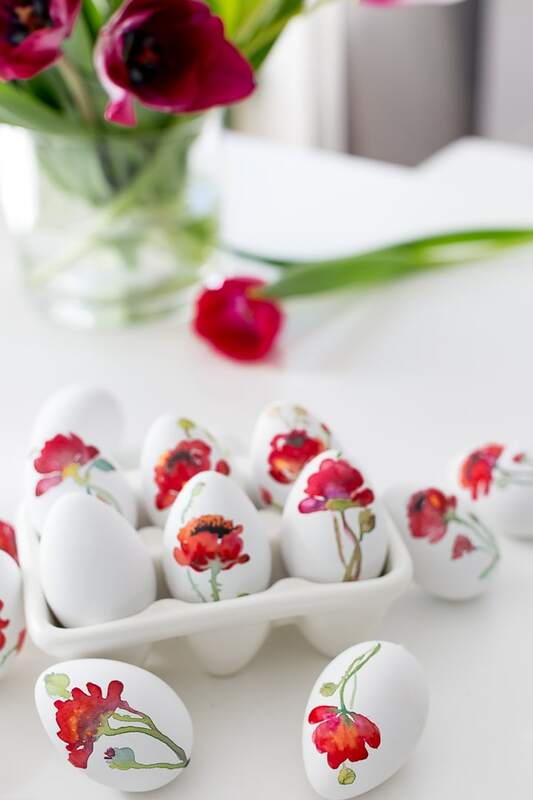 How do you keep them from wilting while they’re on the table? But…they don’t look like the ones in the affiliate link…did you get them some place else? Thank you my friend! And yes, these days those glasses are definitely viewed as margarita glasses… 😉 I just might have to do a table in that theme for summer! !